 Deep tissue massage focuses on realigning deeper layer of muscle and connective tissue. The therapist will apply strong pressure (acupressure) or friction across the grain of muscles to break down adhesions to relieve pain and restore normal movement. Thai Aroma Oil Massage is very healthy and promotes relaxation. Yet even deeper levels of relaxation are provided through a technique called “Magic Relax”. With Magic Relax, the specially trained, sensitive, and skilled therapist is able to impart a profound sense of relaxation and well-being through touch and light strokes on the surface of skin and muscle. Thai Aroma Massage aids in the healing process, decreases muscle reflex activity, inhibits motor-neuron excitability, and promotes a profound feeling of relaxation and well-being. The overall effect is invigorating and rejuvenating. Deep tissue massage is especially helpful in relieving pain and restoring movement in chronically tense and contracted areas such as stiff necks, upper and lower back tightness, and sore shoulders. Magic Relax is reported to be helpful in improving lymphatic drainage and reducing the effects of fibromyalgia.